I remember in high school, owning a VW Jetta put you in a high status position. The Fast and the Furious made its debut in 2001 and the import scene, ricers, and idiots blew up. When we got our licenses a couple years after, many of us had to get a ‘90’s era Jetta. They were quite the rage for me; that is until I drove my friend’s cars. They all suffered from the same issues: the body roll was excessive, they under steered into just about anything, the throws of the shifter were long, the brakes felt like putting your foot in a bowl of mashed potatoes, my friends were having a good day if the electronics worked, and it just felt a bit secluded from the road. In retrospect, we’d say that those cars had character; I would still say that they sucked. If there was one redeemable quality about them, it was their three box style which made them so useful for people. They were spacious for occupants, the seats were perhaps some of the most comfortable seats to ever grace the compact segment at the time, they had great fuel economy, and loads of cargo space. It was perfectly designed to be the ultimate family compact car and VW succeeded in hitting that goal. Of course, my friends only really cared about modifying the hell out of them and who didn’t want to do that in high school? My views of VW have changed over time as I’ve driven just about every Jetta or Passat that came to the United States. The quality was impeccable, their ride became comfortable and well controlled, the cars were ergonomically designed, and they grew in size and allowed for more useable space. They were essentially the ideal commuter cars and to this day, I contemplate purchasing one as an affordable, frugal daily driver. 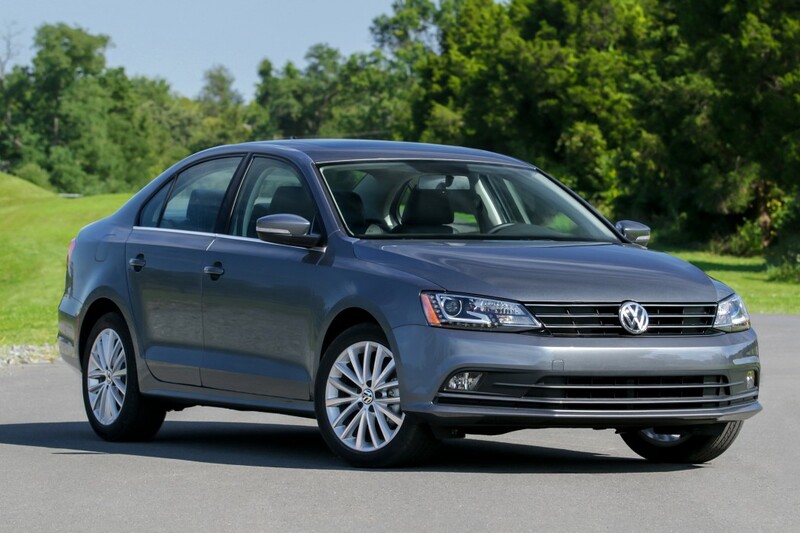 Luckily for me and for Car Fanatics Blog, VW has decided to become one of our clients and has graciously allowed me to test the 2015 Volkswagen Jetta for a solid week. Spoiler alert: I liked it! My test car was a Platinum Gray sedan in the conventional 3-box layout. I’ve heard a lot of gripes about VW’s new body language in that they’re seemingly bland looking. I argue that they’re clean, simple and functional and look far better than the bulbous-bodied cars from previous generations. The SE trim has subtle styling features that maintain the clean overall presence like the LED day time running lights, the singly chrome strip on the exterior window sills, and the multi-spoke 17” alloy wheels. Other than the badging and the window sill, the bright work is only found on the front upper grill slats. The side profile is relatively fuss free except for a lower character line that flows into the fender arches. 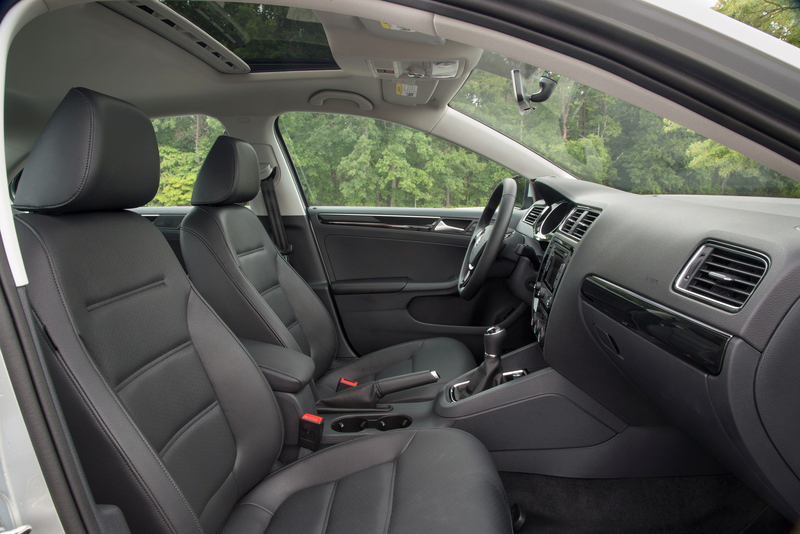 Inside, the Jetta keeps to its simple layout and doesn’t throw in any extravagant content. The gauge cluster is easy to read. The numbers are displayed in a cool white that isn’t hurtful on the eyes. Nestled in between the tachometer and speedometer is a digital display that shows all sorts of information from the car’s trip computers to your media and navigation. The center stack left me in a bit of a quandary. The infotainment unit is rather small touchscreen with ancillary controls that is housed in plastic. It looks too small for the space allotted for it and could have been bigger to aid in viewing. The HVAC controls are a cinch to use and do not require looking down at in order to change temperature or fan speed. The interior illuminated buttons are in red which gives it a very Audi-ish vibe to the cabin. The start button is located aft of the shifter next to a row of potential buttons. Placement next to the steering wheel would have suited the car better. The Titan Black Leatherette seating is tailored for maximum comfort. At first, the seats seemed a little firm but after some travel they are actually very supportive and comfortable. The front bucket seat bottoms are fairly flat which allows for easy ingress and egress and the seat back is wide accommodating for everyone. My tester didn’t have power seats but are heated and adjustable in height, distance from the steering, and contained lumbar support. The tilt and telescoping steering wheel in addition to the seats lets you get into your most comfortable driving position. With the front adjusted, rear seat space is excellent and the largest I’ve experienced in any recent compact car. Like the front seats, the rear bench is mostly flat and easy to get into and out of. 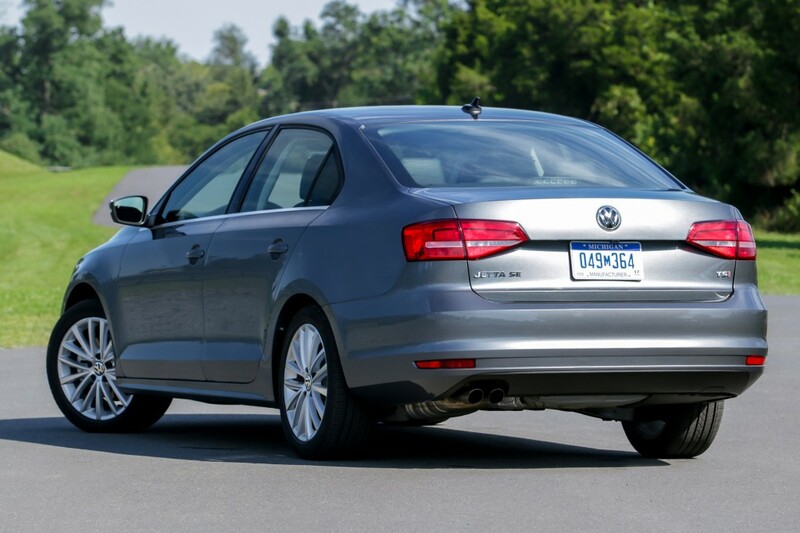 The Jetta has 38.1” of rear leg room which is tops in the compact segment. The rear headroom, thanks to the traditional three box design is 37.1”, only 1.1” less than the front, and with my 5’ 11” stature there was room to spare with me sitting upright. 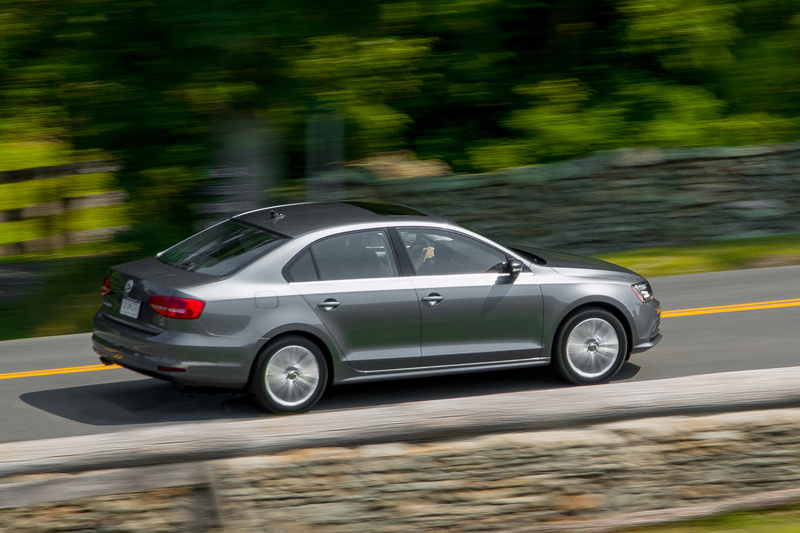 The Jetta boasts a total interior passenger volume of 94.1 cu. ft. with 15.7 cu. ft. of cargo volume. To aid in further storage, the rear seats are capable of folding down and are 60/40 split, helping to accommodate for larger items. Plastics are more prevalent in the Jetta than what I’ve come to expect from this segment of automobiles. The door cards are hard plastic and do not have padding in the upper door sills like everything else in the segment thus far. The center stack and the flow through console is of cheaper plastics than some of my other test vehicles and not what I thought I’d find with a Volkswagen. News that Volkswagen would be utilizing some cheaper materials hit the press a while back. This move was to lower costs and to drive up sales, which is a great business case but it could be at the cost of driving a few customers away. I too was against the move but actually having been in the car for a week, the plastics didn’t take away from the clean layout of the interior and its mostly ergonomic nature. If anything, it makes it a car that is more affordable to more people because the overall build quality of the car has not changed. Visibility is excellent with minimal blind spots and a tall greenhouse. The B-Pillars aren’t as intrusive as they are in other cars and the side mirrors are broad for maximum visibility. Rearward visibility is assisted by a large rectangular rear view mirror, big rear glass, and a back-up camera. The Safety Package that was equipped on my test car includes a blind spot monitoring system to let you know who’s hiding out of sight. I only had one annoyance throughout my week and that was a rattle in the driver’s side door. I couldn’t understand how it came to be because I did not hit the door in any way or go over a pot hole to loosen any clip. Everything else was just peachy. The 1.8-liter turbo 4-cylinder engine provides a healthy 170 horsepower at 6,200 rpm and an abundance of torque of 184 lb.-ft. from 1,500 rpm to 4,750 rpm. The 6-speed automatic is downright flawless; the shifts are smooth and seamless. The ride is taut but far from firm and body roll is minimal. The fully independent front and rear suspension do a great job keeping the tires gripping the road aiding in unyielding stability, the likes of which I have not felt in a non-performance oriented compact in a long time. Turn-in is precise and the steering is nicely weighted even if it provides as much feedback as a PlayStation controller. The brake pedal is firm and is far from putting your foot in a bowl of mashed potatoes. The proximity to the gas pedal was something that I noticed as shifting the right foot from the gas pedal to the brake pedal would sometimes end up with the lip of the bottom of my shoe getting caught on the side of the pedal. The two pedals are on different planes and shifting over from what I’m used to did take some time. 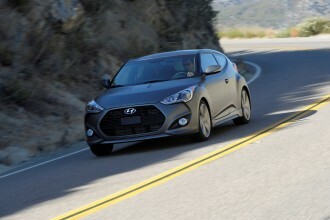 The broad torque plateau lets the car cruise along effortlessly but will provide plenty of thrust for passing maneuvers. There is no point in wringing out the engine until it is forced to shift; keeping it in its torque band will do wonders. With my casual driving habits commuting to Stamford, Connecticut, the fuel economy fluctuated anywhere between 32-36 mpg. I could not get an accurate reading because the average fuel economy reading does not accumulate over time and does a trip average instead. In town, the readings fluctuated anywhere between 17-32 mpg. The instantaneous fuel reading fluctuated more based on throttle input and load but that is never an accurate representation of what the car is capable of achieving. The cabin is quiet and very little noise intrudes inside. The suspension does a great job keeping the imperfect roads from upsetting anything going on inside the car, but at the same time, the suspension doesn’t make for an airy ride. It is buttoned down and well composed which is a great achievement. 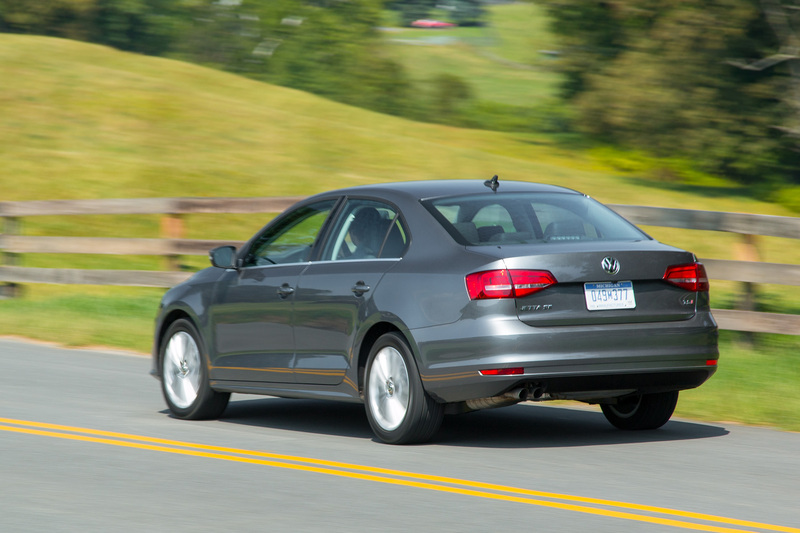 Everything about the Jetta feels solid. From the vault like closing of the door to the way it feels and drives is just done right. My tester, the SE w/Connectivity and Navigation has a base price of $23,650. Add in the options of the Lighting Package w/fog lights for $995, the Safety Package for $695, and the Destination Charge of $820, the MSRP came out to a very reasonable $26,160. With a long list of standard features like a moonroof, stability control, electronic differential lock, etc., the content is fantastic for the price. Add in the intangibles of the quietness, comfort, and space and you do get a lot for your money. I received the Jetta on a Friday afternoon. I drove it into town to run a few errands, came back and parked the car. I was in the middle of my driveway and realized that my parents will be leaving in the morning so I should move the Jetta to the side of my driveway behind my other car. The car was moved, I went inside. The following morning, my parents were looking at the Jetta on their way out and tried to open it using the key FOB. The car wouldn’t respond in anyway. I figured that it was my parent’s age and their foreign ways that was preventing them from learning this new technology of keyless entry. My mother’s reasoning was that it is different because it was German. She wasn’t that far off. I go to see what was going on as I too was in a rush to leave and was going to take the Jetta. The car would not respond to the FOB and I couldn’t find the key hole in the doors. To make matters worse, I blocked my other car in so I could not get out at all. I called up VW America Roadside Assistance and spoke to a representative who was very helpful and suggested that I call up the local dealership to see if they can tow the car there. I obliged and spoke with Mark Desena at Valenti Volkswagen in Watertown, CT. Mark helped me get into the car after popping off the small plastic cover on the door handle which covered the key hole. I was able to get into the car but it would not turn on nor make any sound. At this point, I could not waste any more time so I called in for a ride with my friends. Later that night, I called up VW America Roadside Assistance again and they set me up with a tow truck company that was from a town that was at least a solid 45 minutes away. The tow truck finally showed up, jumped the car and let it run. I turned it off and turned it back on and it stayed on but I didn’t want to risk it failing on me again so I decided it would be best to tow it to Valenti. Monday morning, I received a phone call from Mark regarding the VW and that it was all set. I go in to inquire about it and he said that the battery was completely drained. He agreed that it was odd but they went through a full service check just to make sure. Thankfully, the car never had an issue since that incident. To those of you who may find this to be a harrowing experience, it was a great experience for me because I had first-hand experience with VW America Roadside Assistance and Valenti Volkswagen and came away very happy with the level of quality, service, and promptness with my very first call. Thank you Volkswagen for you excellent customer service.